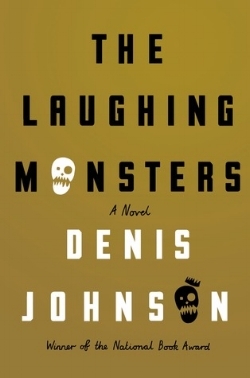 The Laughing Monsters Denis Johnson (USA), Farrar, Straus and Giroux, 2014. 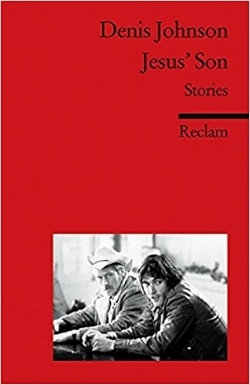 Jesus’ Son Denis Johnson (USA), Reclam, 1992. The Laughing Monsters is a literary thriller which takes place throughout western Africa. There are exploitative spies, missionaries, and politicians, all pursuing their self-interests at the cost of Africans and the African environment. Superb settings and characters amongst a degraded environment, and a lot of fun. One of the characters from a short story in Jesus’ Son says, “Because we all believed we were tragic, and we drank.” This quote sums up quite nicely what takes place in this excellent collection. From the Midwest, to the west coast, Johnson populates his stories with soul-searching characters who abuse alcohol and drugs in an endless pattern of self-destruction. And yet, these stories and characters stand out with their extreme humour and unavoidable sympathy, making this an excellent collection of well-written stories. Another CountryJames Baldwin (USA), The Library of America, 1962. What an incredibly fantastic read. I have read Baldwin before, but this time I was really taken in by his prose and the story he had to tell. Another Country takes place mostly in Greenwich Village in the late fifties. The race and gender relations discussed in the book, unfortunately, resonate in today’s United States: sadly, not much has changed. This does not come as a surprise, yet it is amazing that Baldwin spoke so eloquently about these issues sixty years ago and we still struggle with identity today. The theme of another country is obviously prevalent in the novel. It involves geographic countries and cities, but also our individual and group ‘countries’ we develop, with all the border and political turmoil that take place in geographic countries. The situations in the book deal beautifully with this theme and the struggle to understand and appreciate ourselves and others. Highly recommended! Cities I’ve Never Lived In Sara Majka (USA), Graywolf Press, 2016. Sara Majka mines the fragility and sadness of men and women in this collection of short stories which take place primarily on the Northeast coast of America, in cities, suburbs, and isolated islands. The people in these stories live difficult lives and spend most of their time leaving one place in search of themselves somewhere else. There is not much redemption or discoveries in the stories, just sadness and endless struggles, in spite of the connections they continually make. This is a well-written collection with drawn out character flaws, personal disappointments, and plenty of self-destruction. Charges Elfriede Jelinek (Austria): 2013; translated by Gitta Honegger, Seagull Books, 2016. Jelinek tackles the European refugee crises, specific real-life events which took place in Vienna and throughout Europe. Charges consists of three independent, yet related, performance texts, comments by Honegger, and a conversation between author and translator. Jelinek’s three texts are difficult to follow but are supported by Honegger’s comments, without which, a reader might be quite lost. 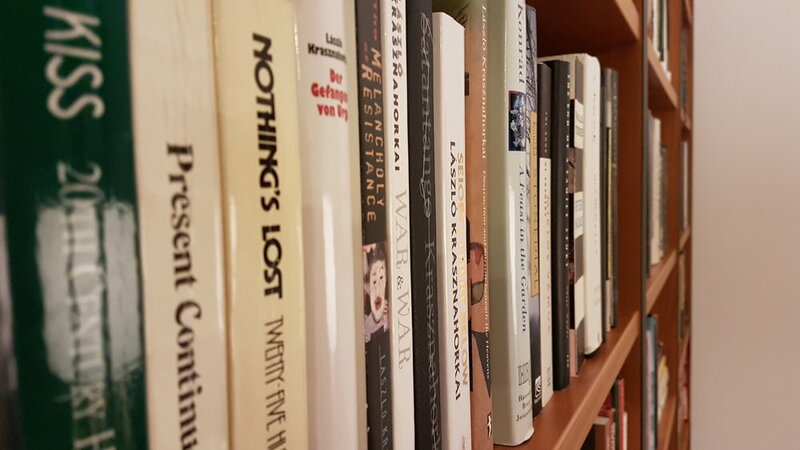 The monologues are closer to nonfiction than fiction and the likes of which can be seen still occurring worldwide. Charges is a sober, and very good read with its fingers directly on the pulse of the continuing refugee crises. Slade House David Mitchell (UK): Alfred A. Knopf, 2017. Slade House is not quite a ghost story, more of a psychosoteric story (explained by one of the characters), where two twins live off the souls of others. It is much like his novel The Bone Clocks but with a contemporary setting. Funny I should read this so near my reading of Radiant Terminus as there are many similar concepts. And like that novel, this one was also not to my liking. I really admire Mitchell and his stories but I just didn’t take to this one, as well-written as it was. 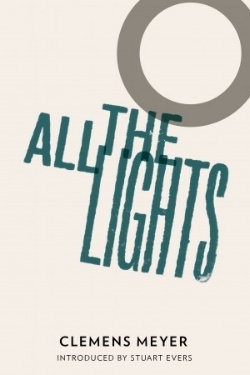 All the Lights Clemens Meyer (Germany): 2008; translated by Katy Derbyshire, & Other Stories, 2011. Completely enjoyable collection of short stories where all of the characters deal with loss in some way. In spite of this downer of a subject, each character forges on and searches for the next bit of success, regardless of terrible odds, and there is an upbeat feel to each story. I prefer the storytelling in Meyer’s Bricks and Mortar better, but still I found this to be a solid and highly recommended collection. Radiant Terminus Antoine Volodine (France): 2014; translated by Jeffrey Zuckerman, Open Letter, 2017. I can see how this novel would appeal to fans of dystopian, science-fiction novels, however, it just was not my thing. The book received a lot of positive attention and Open Letter pushed it quite a bit, so I think my negative opinion is in the minority. I had the hardest time with the thousand year jumps that happened, the one minute compared to the century, the characters all living in the Bardo. There are about a dozen main characters and they are all quite clearly drawn out but they never really amount to anything. And while I am accustomed to nothing happening in novels, the nothingness in this novel was a bit monotonous. In Exile Billy O’Callaghan (Ireland), Mercier, 2008. O’Callaghan’s short story collection takes an extended view of exile, exploring it as a separation of any sort from one’s sense of belonging. Exile figures in each story in some form, from a character’s exile from the sea, to the exile we can feel in broken relationships. The more successful stories take place on Irish islands and discuss the lives lived and lost there. The stories with different settings do not work quite as well but do add to the overall exploration of exile. I am already searching for O’Callaghan’s other collections as I found these stories challenging, intriguing, and very well-written. Woman in Darkness, Luisgé Martín (Spain): 2012; translated by Michael McDevitt, Hispabooks, 2014. An intense story which explores the secrets we keep, the wreckage of relationships we create by our jealousy and doubts, and the abyss we enter as we explore the darkest sides of our identities. While a piece of this novel is indeed about a particular woman who remains in darkness to the main character, Eusebio, the largest part concerns the downward, dark spiral Eusebio travels in his pursuit of knowing this woman. There is much disturbing atrociousness in this story (cruelty to other human beings) but also much to like about it in its telling and conclusion.